Bring your excess garden produce to swap with your neighbors – lemons for chard, lettuce for herbs etc. You don’t need to bring a lot to attend, and you can also bring seedlings, tools or anything related to gardening. Come and meet with your neighbors, trade gardening tips and recipes and have fun. Garden produce (preferably organic), seedlings, garden supplies, books etc. Thanks to everyone who participated for making the Richmond Crops Swaps such a great success this year. We all had a great time sharing food, plants, recipes, gardening tips, and building community. The last Richmond Crop Swap for the season will be this coming Monday 10/7 at the usual time 5:00-6:00 at the Richmond Library. Bring a pot luck dish to share if you like (not required) and please feel free to come and celebrate even if you have no crops to share. 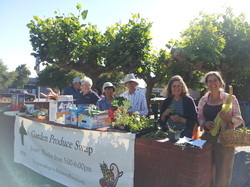 Note that the El Sobrante Crop Swaps, which have also been very successful and well-attended, will continue through October on Tuesdays 5:00-6:00 at Lila's house, 2932 May Rd., Richmond/El Sobrante. Transition founder Rob Hopkins is coming for his first visit to the US this October. Rob will be visiting Northern CA and several other locations. Check here for locations and events. A British permaculture teacher, Rob launched the first Transition Initiative in Ireland in 2005. He has continued lending his energy, ideas, and voice to the Transition Movement as it grows and deepens around the world, in addition to working with his own community, Transition Totnes, to pioneer innovative Transition strategies and projects like REconomy and Transition Streets. Rob's new book,The Power of Just Doing Stuff, launched last month and already made it to the top of the Guardian's bestseller list. The 2013 Crop Swaps in Richmond & El Sobrante are going great. We have about 15-20 people attending each Swap and lots of good food gets exchanged along with gardening tips, recipes and general good times. Come and get to know your neighbors and get some healthy food. No need to bring a lot of produce to exchange - just a few herbs, some seeds, starts, a gardening book, anything. The Crop Swaps will continue through September at least. We will have a regular Swap in Richmond on Labor Day. We also had a very successful Tomato Fest on 8/26. Lots of people brought tomatoes which we sampled and saved seeds from. This will help the Richmond Grows Seed Lending Library get more locally-adapted tomatoes to "loan" out. Hey all you gardeners and urban farmers – it’s time to start up the Crop Swaps again. Come and bring your excess garden produce to swap with your neighbors – lemons for chard, lettuce for herbs etc. You don’t need to have a lot of excess produce to come and you can also bring plant starts, gardening books and tools - anything related to gardening. Come and meet with your neighbors, trade gardening tips, recipes and help out your community. Excess produce can be donated to a local food pantry. This year there will be two Swaps, one at the Richmond Public Library and one in El Sobrante. See below for more details. Also, the first Richmond Swap on June 10th will feature tree collard starts and a West County Master Gardener information table. Come and find out answers to your gardening questions. Note that the first Swap on June 10th will be from 5:00 to 6:30 to leave you more time to check out the Master Gardener table and get your questions answered. There will also be lots of good information and purple tree collard starts you can take home with you.